[0:05] <Matt> that sufficient evidence for you? [0:27] <willmore> As in the scaling is good quality? [0:56] <ijustam> anyone know of a good online schematic drawing tool? [1:06] <willmore> I haven't played any video on mine, yet. [1:31] <RoyK> anyone knows if a new pi is in the works? something with a more modern cpu? [1:33] <ijustam> can i reset my GPIO pins after my python script broke? [1:34] <ShorTie> so, does x86 have gpio ?? [1:39] <ShorTie> if it is so doable, why have i never seen a x86 with gpio ?? [1:40] <Tinkerton> because why would you use x86 for gpio when cheap stuff like the RPi exists? [1:44] <ShorTie> 300mhz and 128 megs of ram, nice increases, lol. [1:45] <ShorTie> i'll stick to my pi, thank you very much, hehe. [1:56] <superlou> Anyone else developing in C on the raspberry pi on linux, and using Sublime Text to edit code by connecting to the raspberry pi in Nemo/Nautilus connect-to-server. [1:56] <superlou> Is it possible to build (run make) on the target (the Pi), not on the sublime text system? [1:56] <superlou> I apologize for the awkward description. Can't figure out the right google terms. [2:07] <CoJaBo> where's that post? [2:11] <CoJaBo> It'd be nice if they can squeeze in the same amount of ram, heh..
[2:16] <CoJaBo> I actually still haven't seen video-output on mine, due to not having the correct video cable lol..
[2:57] <willmore> One data point. Current consumption on my B+ under openssl speed load goes from 0.23-0.24 to 0.32-0.33 when at full turbo. [2:57] <willmore> Load temp seems to go from 40C at stock to 47C at turbo. [3:21] <CyL_> kiely: Have you tries running apt-get update && apt-get upgrade? [3:25] <[Saint]> "E: Unmet dependencies. Try using -f"
[3:27] <[Saint]> When you say "it" you mean "sudo apt-get install -f"? [3:27] <[Saint]> that's "force install deps"
[3:29] <[Saint]> You could always try just pulling in libflite1 directly. [3:30] <NedScott> sounds like the version it wants is in testing and not stable? [3:31] <CyL_> what does rpi-update updates? [6:22] <Boscop> bsch01: and then what can i do? [6:52] <Boscop> where is config.txt? [6:53] <bsch01> you could probably notch that gpu_mem down to 16 if you're not using any gpu stuff. have you verified in dmesg that it is indeed a low memory situation? [6:54] <Boscop> bsch01: could you maybe build protobuf and send it to me so i can build openlighting? [6:56] <Boscop> should i set start_x to 0 ? [7:08] <bsch01> like I said before, have you ran dmesg to see if it is indeed a low memory situation? [7:34] <kgrayallday> okay so you can just pun vlc though the command prompt? i will try this! do you know if it carries adio and video? [7:36] <sudormrf> have any of you used it? 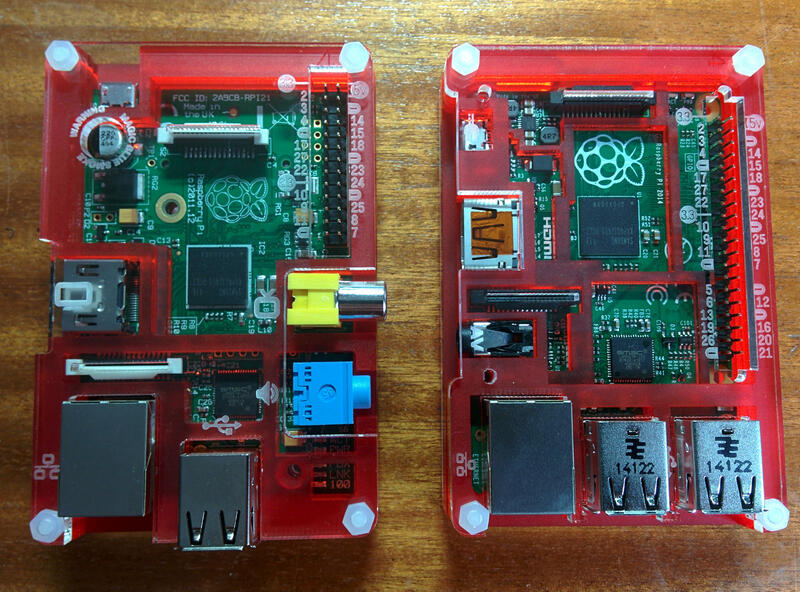 [12:57] <evil_dan2wik> so, today I got given 2 raspberry Pis without the need for them, What do I use them for? [13:01] <zylinx> evil_dan2wik:i use pi as music server. debian with mpd. hooked up to big sound system for our office. [13:03] <evil_dan2wik> except, this is at home. [13:03] <evil_dan2wik> and my family don't like music that much. [13:04] <evil_dan2wik> Isn't that dangerous? [13:04] <evil_dan2wik> Last time I played with mains, I got shocked from something that should have been connected to ground. [13:08] <evil_dan2wik> Torrent server would be nice. [13:08] <evil_dan2wik> Don't care about weather. [13:08] <evil_dan2wik> No idea what NAS is. [13:08] <evil_dan2wik> My router has that built into it. [13:10] <evil_dan2wik> A potato would be less reliable. [13:10] <evil_dan2wik> so, more redundancy. [14:01] <Boscop> what's the best library to handle keyboard and mosue input on raspberry pi for games? [14:03] <shiftplusone> Don't you mean ":D", because SDL is awesome. [14:09] <shiftplusone> slow to handle inputs? [14:13] <gordonDrogon> SDl2 is supposed to use hardware acelleration on the Pi. [14:13] <gordonDrogon> I've not had time to try it though. [14:13] <gordonDrogon> PyGame is SDL. [15:21] <gordonDrogon> my basic interpreter uses SDL and I need to find time to upgrade it to SDL2 soon. [15:21] <gordonDrogon> it's not slow, but it's also not doing 3D rendering. [16:08] <frew> hey guys, I'm trying to make my rpi not turn off the screen after a while, where is that done? [16:09] <willmore> frew, running raspbian? [16:12] <willmore> That covers both raw console mode and X. [16:12] <willmore> I was using a little 320x240 serial LCD and it was blanking and the console fix worked for that. [16:15] <willmore> Should be able to. [16:59] <shahin8r> I have a 3d printed case that has an logo cut out of it (its about 20x5cm big) and I want it to be lit up by RGB leds (so I can change color on the logo by script). Does anyone here have any advice on how to do this? Is a LED strip the best way to go or should I just solder a few LED's for this? Do I need anything else than a rpi, resistor and LED? [17:00] <gordonDrogon> you'll need 3 resistors per RGB LED, but other than that, go for it. [17:01] <shahin8r> gordonDrogon: ok, how many LED's do you think is enough for lighting up the 20x5cm logo? [17:02] <gordonDrogon> to do it evenly - at least 3 along the long edge I'd guess. [17:02] <gordonDrogon> you might need a diffuser. [17:02] <gordonDrogon> Hm. LEDs are 5mm. maybe a lot more. [17:03] <shahin8r> what's a diffuser? [17:04] <shahin8r> Need to switch between White and Blue, maybe i'll just use 4 each of these http://www.adafruit.com/products/754 in white and blue? [17:04] <[Saint]> Without a diffuser you'll have silky looking obvious points of light. [17:04] <[Saint]> As opposed to a nice uniform glow. [17:05] <gordonDrogon> shahin8r, do be aware that the max. current draw from a gpio pin is 15mA and that you are only suppsed to draw (or sink) a max. of 50mA overall. [17:05] <gordonDrogon> those LEDs need 20mA for full brightness. [17:06] <shahin8r> gordonDrogon: hmm ok. so I can't do this? [17:07] <gordonDrogon> unless you use a driver of some sort and power them off the 5v supply. e.g. uln2803. [17:08] * [Saint] once made a binary clock with huge rgb LEDs and ping pong balls as makeshift diffusers. [17:09] <[Saint]> It did seconds from epoch in binary. [17:09] <shahin8r> gordonDrogon: do I need extra power or is the rpi charger on 5v2a enough? [17:10] <gordonDrogon> shahin8r, well add it up - if each LED is 20mA, then you can power 50 from a 1 amp suppy. [17:12] * [Saint] now wonders if/when there was ever a time or will be a time where seconds since epoch matched the date string. [17:12] <[Saint]> Ddmmyyhhmmss, or whatever string you fancy to make it work. [17:14] <gordonDrogon> shahin8r, there is a 5v pin on the Pi. think of the driver as an amplifier. the Pi provides 3.3v on each gpio pin but if you try to take more than 15mA per pin or 50mA overall from the gpio pins then you lose the magic black smoke, so you need the buffer/amplifier and to supply that & the LEDs off 5v. [17:15] <shahin8r> gordonDrogon: got it. thanks. can you get these amplifiers at adafruit? [17:26] <gordonDrogon> shahin8r, I'd start by looking for some simple tutorials on LEDs, resistors and Ohm Law. [17:31] <Da|Mummy> my sandisk 64gb usb3 drive wont load on openelec on rpi, is there something simple im missing here? [21:44] <knob> Wow it's quiet in here. [21:47] <knob> Hm.. good thing I didn't work with mine today! [21:48] <knob> One thing I want to work with in a short while: Many of my rPis are behind networks I cannot do "port forward"
[21:49] <shiftplusone> I have it on good authority that the mine slave config options will be disabled by default in the future builds. [21:49] <shiftplusone> knob, why not vpn all up in there? [21:50] <knob> shiftplusone, but how would I tell the rPi "I want to connect to you... "
[21:50] <shiftplusone> they're on the same network, no? [21:51] <knob> What do you think? [21:51] <knob> And if the vpn goes down... can I set it up so it tries to re-connect auto? [21:54] <shiftplusone> yeah, I think think openvpn will do that, but mine runs on a linode vps which has 100% uptime, so I'm not sure. [21:56] <shiftplusone> just checked, yeah vtun is what I was thinking of. [21:57] <shiftplusone> Don't have any experience with it. It's something a wise man recommended once upon a time. [22:06] <niston> have a public reachable ovpn server, where clients on the Pi connect to this. on the VPN then, each pi can have a "management" ip. [22:21] <evil_dan2wik> Would it be possible to have a pi start, have things running on that pi and then have another pi network boot off of that pi? [22:22] <emacer> anyone know where I can ask for help with opkg? Specifically, I'm looking for a way to specify login information for an ftp server that I want to configure as a source. [22:25] <evil_dan2wik> do you know how to do that? [22:39] <gordonDrogon> vtun is a cheap & cheerful vpn solution if you have e.g. a VPS that accepts it. openvpn is "industrial strength" and more feature-full. [22:58] <CoolApps> My RPi suddenly stopped powering the two USB ports. [22:59] <CoolApps> Both ports are used with adaptors. [22:59] <CoolApps> One is WiFi, one is Bluetooth. [23:00] <CoolApps> I have noticed the RPi dropping the power to the USB devices a lot before this happened. [23:01] <CoolApps> I had to reboot the RPi to get it working again. At one point, fiddling with the WiFi adapter got it working. [23:02] <CoolApps> My use is a web server. Apache, PHP5, and FTP (vsftpd) server. [23:02] <CoolApps> Also with a few changes for thimgs to work how I want. [23:02] <CoolApps> Could the RPi USB ports be fried? [23:04] <CoolApps> Just a little note. I have tried the adapters on a PC and they work just fine. [23:06] <CoolApps> I can feel heat within the adapter, but it could just be the heat conductivity. [23:06] <gordonDrogon> is it a B+ or a B? [23:06] <gordonDrogon> and if a B, revision 1, 1.1 or 2 ? [23:06] <CoolApps> Possibly a B. [23:07] <CoolApps> It has this early type of element14 packaging, let me check that..
[23:08] <gordonDrogon> it might have polyfuses on the USB ports if its an early one. [23:10] <CoolApps> Since I don't know where it is, I have found an image of it. [23:10] <CoolApps> The one with the label. [23:12] <gordonDrogon> doesn't really help. [23:12] <gordonDrogon> look under the Pi - if it has 2 green blobs near the usb ports then they're the polyfuses. [23:12] <CoolApps> I'll start opening up the casing..
[23:12] <gordonDrogon> actually they're on-top, to the left of the USB ports. [23:14] <Leucomelas> I've a question, for first, why the differences about arduino and raspberrypi ? And why did you chosse Raspberrypi ? [23:15] <gordonDrogon> Leucomelas, you don't have a Pi yet then? [23:15] <gordonDrogon> Pi runs Linux - that's the answer to both. [23:16] <gordonDrogon> however I have many Pi's and equally many Arduino, or ATmega based systems. [23:16] <gordonDrogon> Pi is dedicated to education - something I'm passionate about - no other Linux SoC is. [23:19] <gordonDrogon> Arduino isn't going to do the recignition thing. [23:20] <gordonDrogon> hard for arduino to do email too. not impossible technically. [23:20] <Leucomelas> but raspberry yes? [23:20] <gordonDrogon> the Pi runs Linux and OpenCV is an image recognition library that runs under Linux. [23:21] <gordonDrogon> Pi is Linux ... and Linux handls email very well indeed. [23:21] <CoolApps> I see the polyfuses. [23:21] <gordonDrogon> The Pi is a small Linux system by todays standards though. [23:21] <gordonDrogon> CoolApps, ok - they're probably "blown". They do recover - usually in a few minutes. [23:23] <gordonDrogon> Leucomelas, the Pi camera has been with us for about a year now. That link is not an Arduino camera, despite the name. [23:24] <Leucomelas> yep, so, for the finally project 'face capture' and capacity to speak with him (simple order like 'read my email'), i can found raspberrypi captor etc? [23:25] <CoolApps> Is it normal for them to be "blown" after using two radio/wireless adapters for days? [23:25] <gordonDrogon> openCV does facial recognition. not sure what there is for speech recognition, but I have seen some demos - I'm sure you can find it in google. [23:25] <gordonDrogon> CoolApps, no idea really. the limit is 140mA. [23:26] <gordonDrogon> RS or Farnell in the UK - they'll have a local outlet. [23:26] <gordonDrogon> or buy from the UK from them or e.g. pimoroni.com, etc. [23:32] <gordonDrogon> yea, personally, I'd go for the Coup� case. [23:32] <gordonDrogon> but I have both those case types. [23:32] <gordonDrogon> the coup� is a bit cheaper too and lets you get at the GPIO pins. [23:33] <gordonDrogon> B & a B+ in the Coup� cases. [23:35] <Leucomelas> I must buy another product immediately for starting play? [23:35] <gordonDrogon> usb keyboard & mouse? [23:35] <gordonDrogon> hdmi monitor - but you may already have those. [23:36] <gordonDrogon> and you need an SD card to put the OS on. [23:37] <gordonDrogon> get a good branded, well known make. [23:37] <gordonDrogon> also power supply - any standard 5v USB one, but make sure it can supply 2 amps. [23:38] <gordonDrogon> SD card and PSU are the 2 main problem areas. [23:39] <gordonDrogon> mostly becsue people buy cheap ones. [23:39] <[Saint]> shiftplusone: you about good Sir? [23:39] <[Saint]> You're somewhat of a ua-netinst expert I gather, no? [23:44] <shiftplusone> did you catch any error messages? [23:44] <[Saint]> I kinda assumed it would be using USB for a storage area during download, but it just occured to me this may not be the case. [23:44] <[Saint]> I did not, no. It won't even get to a point where I can actually talk to it. [23:44] <shiftplusone> No, it should, since it's just a bootstrap. [23:45] <[Saint]> I shall seek the individual in question, thanks. [23:45] <shiftplusone> I don't see any relevant open issues on github, so... yeah, no idea. [23:47] <[Saint]> They often prey on the uninitiated. [23:47] <[Saint]> Its almost always possible to acquire the components separately for much less. [23:47] <gordonDrogon> Leucomelas, I think so - I don't speak swiss though, but that looks like the right bits. [23:47] <gordonDrogon> SD with noobs pre-installed, PSU, hdmi cable. [23:48] <gordonDrogon> google translates - ah comes with a box too. [23:49] <[Saint]> Definitely shop around. [23:49] <gordonDrogon> but sometimes its easy to just get everything in one place..
[23:49] <[Saint]> This is true.